David Boughton Brings Science to Life! (Erie, PA) - Pennsylvania Sea Grant was one of four groups to be honored by the Pennsylvania Steelhead Association for efforts to conserve, restore, and provide access to some of Erie County's important lands and waterways. 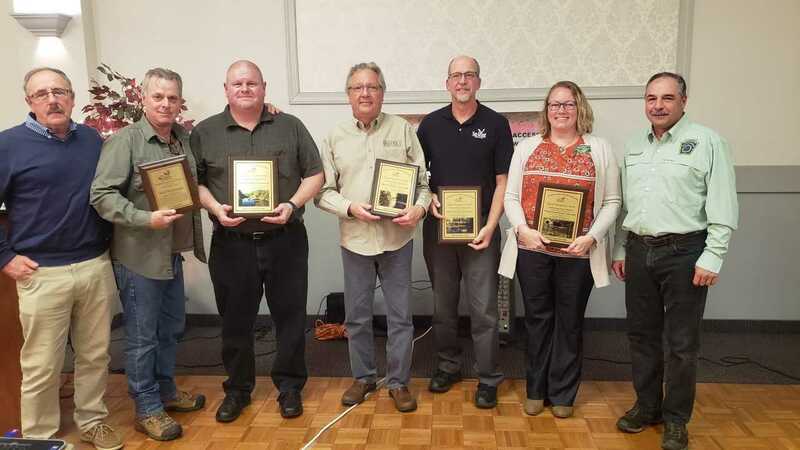 The awards were presented to PA Sea Grant, the PA Fish & Boat Commission (PFBC), the Western Pennsylvania Conservancy, and the Lake Erie Region Conservancy during the Association's annual banquet, held on November 3, 2018. PA Sea Grant staff have worked collaboratively with the other honorees for over 20 years, along with state agencies, the County of Erie, many local municipalities, and most importantly…property owners.Through these collaborative efforts, PA Sea Grant has conserved and/or assisted in the conservation of 45 projects since 2004. These projects total 1,737 acres of permanently conserved lands, nearly all of which are open for recreational use by the general public. These conserved areas include 25 properties that establish fishing, farming, forested riparian and open space conservation easements. Twenty (20) of these easements are fishing easements through the PFBC’s Lake Erie Access Improvement Program. Since 2004 when this program was enacted by the state legislature, PFBC (with PA Sea Grant’s assistance since 2010), has approved funding for and closed on 18 fee simple (meaning outright acquisition) projects and 45 public fishing and conservation easements. These purchases have ensured safe access for anglers to Lake Erie shoreline and eight (8) local tributaries where steelhead are found migrating upstream from September through April every year. The total amount of stream frontage obtained through PFBC’s acquisitions and easements is now 25.77 miles. PFBC and PA Sea Grant are currently working with another 20 property owners whose collective stream frontage is approximately another 13 miles. Fishing is a vital recreational activity in the Erie region, bringing in more than $10 million annually to the local economy. Our work with the PA Fish & Boat Commission through the Lake Erie Access Improvement Program ensures safe access, permanently conserves land, and importantly provides compensation for landowners willing to grant stream access. "PA Sea Grant works here in the Erie region and across the state, engaging in a variety of research, outreach, and education programs, said David Skellie, PA Sea Grant’s Coastal Land Use & Economic Specialist. “Our efforts in the Lake Erie Access Improvement Program is a win-win for anglers, landowners, and for land and water protection efforts. My co-worker Tom Cermak and I are honored to have PA Sea Grant receive this award acknowledging those efforts and collaborative partnerships."